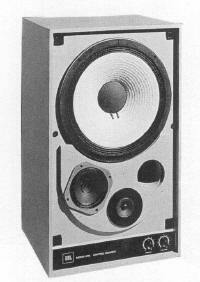 With the great success of the 4320 Studio Monitor in the 1960s, the JBL management began to explore ways in which they might extend their offerings in this area. The increasing complexity of recording studio mixing consoles resulted in ever-larger physical dimensions of the electronic equipment. 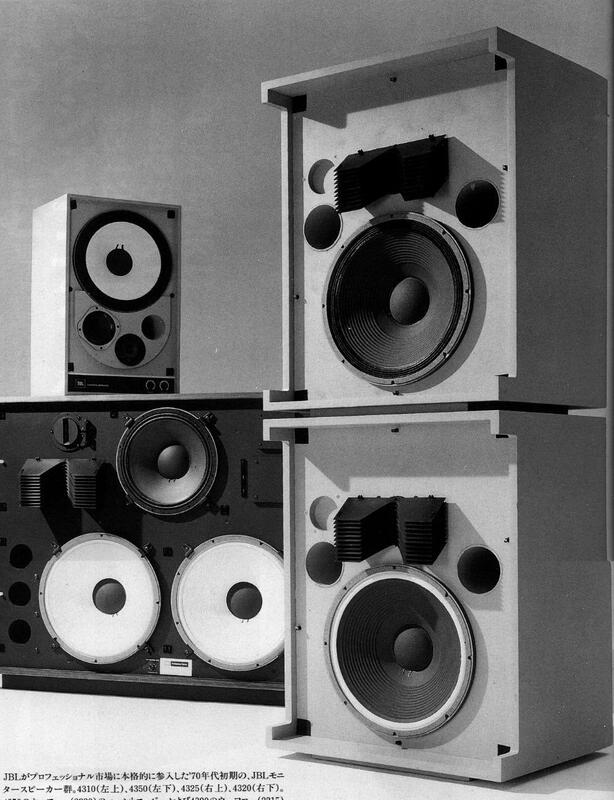 Effective installation of floor-standing monitor loudspeakers was not always possible or even desirable, due to the inability to locate the audio engineer beyond the near-field effect of the reproducers. 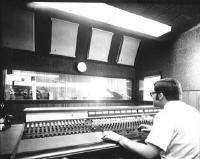 What the industry needed was a compact system that could be placed either on the console bridge, control room window shelf, or suspended from the ceiling. This would leave the larger 4320 available for even more critical listening to playbacks either in the studio or the control room. The difficulty lay in developing such a modest-sized system that retained the same highly definitive, analytical character of the 4320 while accepting some small modification in low-end performance. It is not completely clear who was chiefly responsible for the system design, although Ed May was certainly a central contributor, with Bart Locanthi providing analog computer analyses and other engineering input. Our best source for information, Arnold Wolf, recalls receiving a phone call at his Berkeley design office from James Barthell, then Product Development Coordinator, informing him about the project. Barthell also provided the transducer list (123A woofer, LE5-2 midrange and LE20 tweeter) and the internal volume requirement in cubic inches. In their effort to provide a superlative system possessing the lowest possible distortion measurements, the engineering staff told Wolf that it would be highly desirable if the enclosure did not have any front lip or solid extensions forward of the plane of the front baffle. No one recalls who suggested that the crossover output attenuator controls be placed on the front of the enclosure, but it appears to have been born of necessity. The relative inaccessibility of the usual rear panel position of any network controls when an enclosure is suspended or placed up against a control room window made the front baffle the only logical choice. Wolf remembers seizing on this requirement because it offered a great opportunity for developing some strong graphics related to the knobs' rotational position and, of course, the corporate logo. This additional visual accent took the overall design out of the consumer "bookshelf" category and gave it an unmistakable professional character. In this respect, it fully embodied the JBL industrial design philosophy -- to give external visual expression to the internal and implicit excellence of the functional product within. The 4310 quickly became one of the most successful products in the JBL catalog and paved the way for additional products in the monitor series. By the mid-1970s the JBL Studio Monitors had become ubiquitous in the U.S. recording industry and increasingly evident in control rooms around the world. Historical footnotes: The initial acceptance of the 4320 by Capitol Records in Hollywood led Bill Thomas to believe that the Hollywood birthright of the system would provide an additional selling point. He accordingly asked Wolf to come up with a new logo treatment for the sides of the enclosure that would combine the JBL mark with the prominent word "Hollywood," to be silk-screened onto the finished surfaces. This reference lasted for a while, but the apparent indifference of most customers to the supposed glamour of the Hollywood link eventually caused the company to drop it. Besides, it had to be acknowledged that JBL's location on Casitas Avenue in the Los Angeles district known as Atwater was more readily associated with Glendale than Hollywood -- irrespective of the movie capital's highly elastic geographic boundaries. 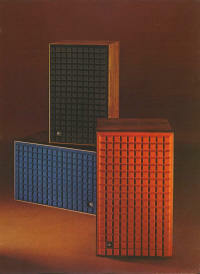 After some field experience with the 4310 and additional testing, it was found that the unique uninterrupted flat baffle treatment did not provide as significant acoustical advantages as had been supposed. Accordingly, the feature was dropped. The tweeter was replaced with a smaller diameter unit to increase high frequency dispersion and the crossover frequencies were modified to yield a smoother response. The subsequent version was given the model number 4311 and was built with a conventional recessed baffle and with the H.F. radiator raised to the acoustical plane of the low frequency driver and enclosure front edge. At precisely the moment when the 4310 was gaining its widespread acceptance, JBL experienced the transfer of ownership from Bill Thomas to the Jervis Corporation controlled by Sidney Harman. One of the first personnel changes was the appointment of Irving Stern to head JBL's marketing effort. 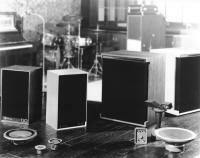 Stern immediately saw the success of the Studio Monitors as presenting a golden opportunity in the consumer products field. He felt that the same systems, suitably reincarnated in consumer dress, would gain from the reputation and cachet of their professional cousins. This concept was not embraced by everyone in the company. Many felt that consumer versions would tend to dilute the distinct professional identity of the monitors and perhaps weaken the special sense of exclusivity enjoyed by commercial users. After much debate, it was decided to reconfigure the 4310 for its debut in the consumer division as the L100. A number of simplifications were made in the new model. The transducer array remained the same, but the raised section of the front baffle was eliminated as were the dividing network attenuator controls. In pondering the new product back in his Berkeley design office, Arnold Wolf wondered what could be done to invest a simple bookshelf enclosure with a unique identity. "The problem with bookshelf designs is that, in most home settings, the only effective visual element is the front grille," Wolf said. "A panel of stretched cloth, however attractive by itself, does not communicate anything distinctive between one loudspeaker or another." What he wanted to find was some way to impart dimensionality to the plane surface of the grille. This would not only add visual interest and a unique identity, but it would suggest, on some level, the three-dimensional solidity of the stereo sound image. Various possibilities were explored. One promising path was the use of a special grille fabric containing a high percentage of Dacron TM yarn. This material had been used in "permanent press" trousers, where a controlled heat treatment produced a sharp crease that remained intact through subsequent use and even washings. The problem in the grille application was that the fabric weave would have had to be much looser in order to be acoustically transparent. The reduced density made it much harder to emboss a permanent relief pattern in the material and also may have required intermediate supporting elements across the back of the grille. Another way had to be found. Wolf had seen the use of foam plastic as coverings for microphones -- either as breath filters in the studio or as wind shields in outdoor applications. He reasoned that, if the plastic was sufficiently open to sound transmission at the very low sound pressure levels encountered in microphone use, it surely would be transparent enough for a loudspeaker grille. Investigation proved this to be the case. Reticulated or open-pore foam tested out as better than most conventional grille fabrics. Wolf has stated that, while he cannot be absolutely sure of this, it appears that the L100 was the first use of shaped foam as a loudspeaker grille material. Methods for contouring and shaping foam were fairly sophisticated, even at that time, and a striking deep waffle-like pattern was quickly devised that lent itself to the available production methods. The question of color became the next stumbling block. The integrally-colored material options were all too dull and weak to be acceptable. Dyeing did not work well. Finally, someone in JBL's Manufacturing Division (probably Tony Pacheco, Manufacturing Manager) attempted the obvious: paint it. A compatible paint formulation was found and, with the viscosity carefully controlled, the openings in the foam did not fill during the spray process. This happy result made it economically feasible to offer the L100 with three grille color options. When the marketing plans were prepared for the product's introduction, Irv Stern came up with the felicitous name of "The Century" to go with its L100 sales number. 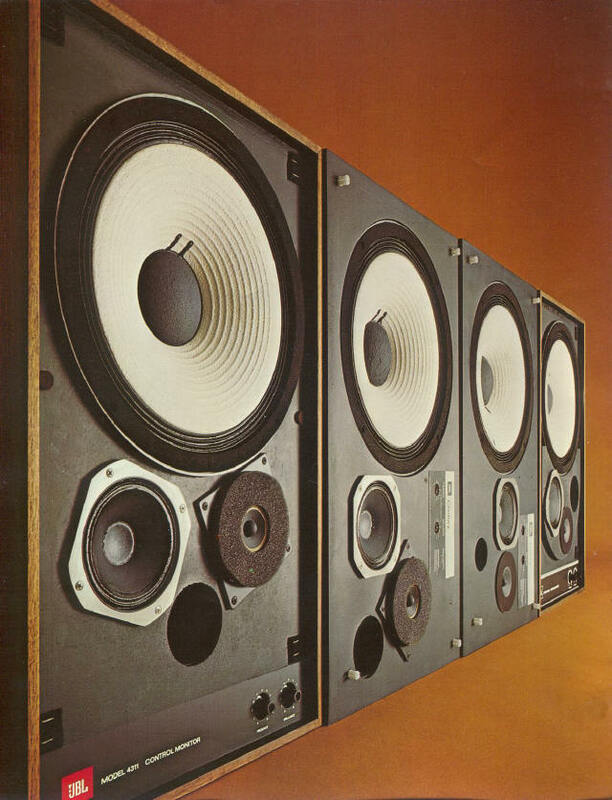 After its introduction at the 1970 summer Consumer Electronics Show in Chicago, the L100 went on to become not only JBL's most successful product up to that time but, from all indications, the best-selling loudspeaker system of the decade.